A hectic workday followed by homework and after-school activities doesn’t mean you can’t have a fresh, simple meal. 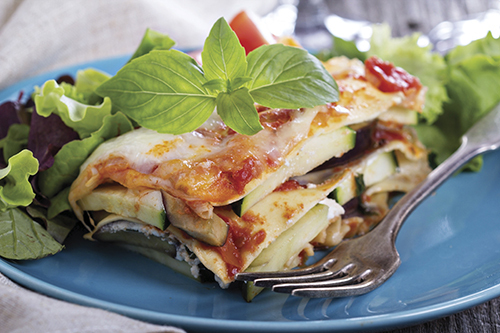 Check out these delicious dishes you can prepare and serve without the hassle. Find more ideas to make your busy weeknights easy at Culinary.net, www.aicr.org, www.unclebens.com, and www.uscatfish.com. Heat oven to 450° F. Grease 13-by-9-by-2-inch baking pan; set aside. Slice eggplant and zucchini in 1/2-inch slices. Layer on two baking sheets and coat both sides of vegetables with cooking spray. Roast 20 minutes. Toss vegetables and continue roasting until well browned and soft, about 20 minutes more. Transfer vegetables to large bowl. 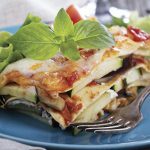 Reduce oven temperature to 375° F.
Cook lasagna noodles according to package directions. Separate noodles and let cool slightly. In a medium bowl, mix together cheese, eggs, Parmesan, nutmeg and garlic powder. Spread a thin layer of sauce over bottom of prepared pan. Cover with a layer of pasta (noodle strips slightly overlapping). Spread with one-third of ricotta mixture. Sprinkle 1/4 of the mozzarella over ricotta. Spoon 1/3 of roasted vegetables on top. Top with 1/2 cup tomato sauce and continue assembly as directed until there are four layers of pasta and three layers of filling. Spread remaining sauce on top and sprinkle with remaining mozzarella. Cover pan with aluminum foil and bake 30 minutes. Uncover and continue baking until golden and bubbly, about 15 minutes more. Let stand 15 minutes before serving. Dressing: In small glass bowl, stir together coconut milk, peanut butter, rice wine vinegar, soy sauce, red curry paste, cayenne pepper, and hot water; set aside. Cook rice according to package instructions. Makes about 3 1/2 cups. In center of individual plates, place about 1 cup rice. 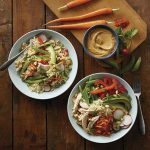 Arrange chicken, carrots, pea pods, red pepper, avocado, radishes, peanuts, and green onions around rice then drizzle with dressing. Mix Cilantro-Lime Sour Cream ingredients to combine. Lightly brush fish with 1 tbs. olive oil. Season with salt, pepper, and smoked paprika or chili powder. Prepare fish on grill or bake until done. Place in refrigerator to cool. When cool, cut into bite-size pieces. Inlarge skillet, heat 1 tbs. oil over medium-high heat. Saute red pepper and onion until soft, about 5 minutes. Add corn, red pepper flakes, cumin, and salt and pepper, to taste. Toss to mix and saute 3 minutes. Transfer to bowl and add cilantro. Heat pan large enough to hold flat tortilla to medium heat. Lightly brushpan with remaining olive oil. Spread tortilla on work surface. On half of each tortilla, spread refried beans and vegetables; top with fish. Place in heated pan and sprinkle 1/2 cup cheese on other half of tortilla. 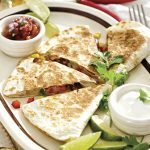 Heat until cheese is melted and tortilla is lightly crispy. Fold cheese side over vegetable side and remove to plate. Cut each tortilla into four pieces. Serve with Cilantro-Lime Sour Cream.